I’m sure a lot of people are unaware of this step, that includes me. When Dennis told me about it, I was surprised coz I didn’t know that such thing exists. It was a bit hassle, though, but in reality, doing this can and will save you from trouble later on. If you ever plan to retain dual citizenship or change your Philippine passport to your married name then this step is needed. – Duly accomplished Report of Marriage (ROM) Form in four (4) copies. – International Marriage Certificate (Iuitreksel uit de huwelijksakte) from the Gemeente. The Marriage Certificate (MC) should first be legalized by the Dutch Ministry of Foreign Affairs (Ministerie van Buitenlandse Zaken) located at Bezuidenhoutseweg 67, 2594 AC Den Haag. (present original and make photocopies). – Four (4) photocopies of the valid Philippine passport of husband and wife. (present original and submit photocopy of information page). ** Stamped, self-addressed return envelope for registered mail. The Embassy of the Philippines will forward the Report of Marriage (ROM) to the Philippine Statistics Authority (PSA) in the Philippines. 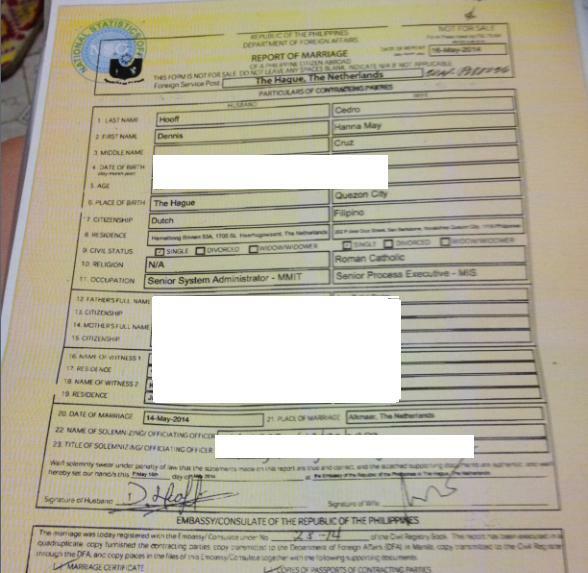 The PSA-certified Marriage Certificate (MC) may be retrieved in the Philippines three months after the filing of the Report of Marriage (ROM) at the Embassy of the Philippines in The Hague. Always keep a personal copy of the ROM for your file. We filed for report of marriage two days after our civil marriage in Alkmaar. We did it to avoid having to worry about Affidavit of Delayed Registration and its fees anymore. hi did you notorized your forms?